Subiendo como una moto: July 20th, 2001 : Ax 3 Domaines....Aupa Laiseka! The short, 166 kms stage, without Pailheres as entrée and coming after the rest day, was perfect for a very fast final ascent. And the speedometers, as well as the fans, will not get disappointed. Ullrich attacked straight after the beginning of the climb. Only Lance could follow him. After a bit of yo-yoing, in order to make us sure that he represents the purest Basque climbing style, Laiseka flew past both of them. 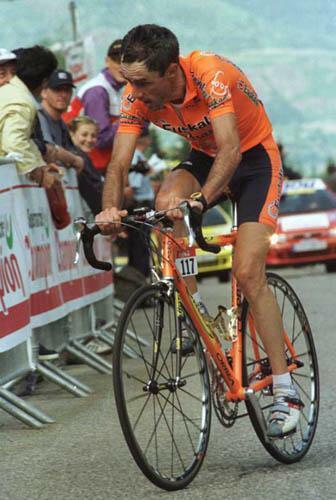 Some minutes later, Armstrong caught him but didn't bother to sprint for the 2nd place and for the actual record of Plateau de Bonascre.